Liverpool stand three steps from Premier League heaven after all the qualities required to win titles were put to the test by Norwich City at Carrow Road. Brendan Rodgers's side - it is still just too early to call them champions-elect - showed their attacking brilliance, resilience and enjoyed a little good fortune to hold out for a win that at one stage looked a formality. Early goals from Raheem Sterling and Luis Suarez were examples of the fluidity and brilliance that have become Liverpool's trademark this season, but those other factors were at work as they dug in to go five points clear at the top of the table with a 3-2 victory. With all the other cards falling into place this week as Sunderland took four points off Manchester City and Chelsea, it was a result that completed another perfect weekend for Liverpool - and for supporters heady on the anticipation of their first title in 24 years. Liverpool - who host Chelsea, visit Crystal Palace and return to Anfield to face Newcastle - may not even need their three games to complete the job. If they do not win the title now, though, it will be regarded as one of the biggest missed opportunities in their history. Once again, captain Steven Gerrard led by example at Carrow Road, especially late on when struggling Norwich got the scent of an unlikely point. And his message was the same as after the win against Manchester City a week ago - one more obstacle successfully cleared, on to the next. The reaction of every member of Liverpool's camp at the final whistle told the tale. After Chelsea's shock defeat at home to Sunderland, this was an opportunity to be grabbed with both hands. How nervously they clung to it during those tense final moments in Norfolk. Adding to a sense that this will be Liverpool's title season at last, even those Rodgers has sent away from Anfield have been making crucial contributions. Oussama Asaidi's late winner for Stoke City against Chelsea in December looked like a minor inconvenience for Jose Mourinho at the time. When another on-loan Liverpool attacker, Fabio Borini, did the same for Sunderland at Stamford Bridge on Saturday night, he may have inflicted the fatal blow to their title bid. Sunderland have acted almost as Liverpool agents in this pivotal week, first taking two points off Manchester City with a 2-2 draw at Etihad Stadium, then beating Chelsea to inflict on manager Jose Mourinho his first home Premier League defeat in 78 games over two spells. While belying their own status as strugglers for survival with top-class performances against two of the Premier League's elite, Sunderland have also earned themselves an honourable mention in any discussion should the Merseysiders claim their first crown for 24 years. Bottom of the table, and more or less ushered towards the Championship after their home defeat by Everton a week ago, Gus Poyet's men are proving the most unlikely allies, fuelled by their own desperation to stay up. And what irony that the young Italian Borini, once a Chelsea fringe player and sent out on loan to Wearside after an unfulfilling first season at Anfield, should deliver what may prove the decisive blow with his calmly taken 82nd-minute penalty after Connor Wickham had equalised a Samuel Eto'o opener. The bitter sarcasm Mourinho aimed at referee Mike Dean and his superior, referees' chief Mike Riley, after the match reflected the damage he suspects this defeat has done to Chelsea, although their visit to Liverpool next weekend still offers them some hope. But that encounter falls between the Blues' two Champions League semi-final games against Atletico Madrid. Manchester City, meanwhile, will be hoping that a win at home to West Brom on Monday will put pressure back on the leaders. They will also hope Liverpool and Chelsea cut each other up with a draw next Sunday. The permutations may still be head-spinning but one thing is clear: Liverpool will never have a better chance to end the long wait, and return to the perch they were so unceremoniously knocked off after that 1990 triumph. 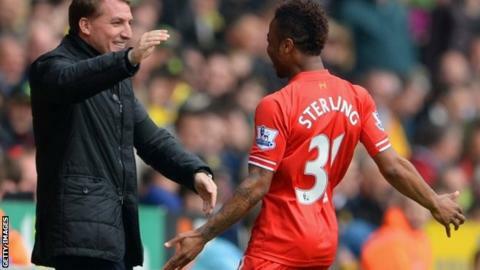 From the moment Rodgers' side lined up against City at Anfield last Sunday, everything has fallen in their favour. This increased expectation - we can call it a likelihood now - about a title win that appeared inconceivable before the start of the season brings pressures of its own, especially with anticipation almost at fever pitch among the Anfield support. So far, of all the teams at the top, Liverpool have looked the least vulnerable, putting together 11 straight league wins to move from fourth to first. If they do not put the finishing touches to this season, they know - and plenty will be ready to remind them - that they will only have themselves to blame.